DR. BASSLEER BIOFISH FOOD REGULAR contains a very high level of protein. It provides fish with all vitamins, trace elements and minerals they require. Ornamental fish fed with DR. BASSLEER BIOFISH FOOD are distinctly more colorful and active. Both their growth and their fertility are promoted. 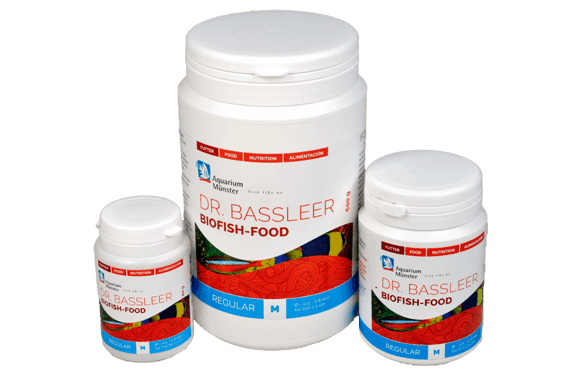 DR. BASSLEER BIOFISH FOOD REGULAR is significantly more nutritious than most conventional ornamental fish foods. Only ever feed as much as the fish are able to consume within a few minutes. DR. BASSLEER BIOFISH FOOD REGULAR is offered in the different granulate sizes M, L, XL, XXL and 3XL. The granulates in smaller pellet size M sink slowly, thus providing nutrients to all three water zones. This gives surface feeders, fish in the middle zone as well as bottom feeders alike a fresh and balanced diet.